Meet your guide at the airport and transfer to your centrally located hotel. If time permits, we will visit the the symbol of Guilin - Elephant Trunk Hill. 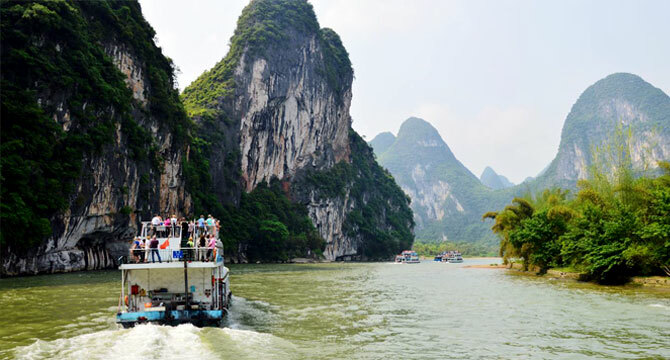 After breakfast, we will drive about 40 minutes to Zhujiang Pier to enjoy a downstream cruise (about 4 hours) on the world's top watery wonder -- Li River. Lunch will be taken on the ship. Disembark in Yangshuo and have a leisure walk on the West Street. Later, drive back to Guilin. This morning visit the Reed Flute Cave. Then you will be escorted to the airport for the flight to Zhangjiajie. On arrival at Zhangjiajie Hehua Airport, you will be met and transferred to your hotel in Wulingyuan district. Note: The direct flight from Guilin to Zhangjiajie is not available on Monday. 10:00 am, drive to Zhangjiajie National Forest Park. You will take a cable car up to the Yellow Stone Village (a mountain) to enjoy a 2-hour walking trip on the awesome mountain. Afternoon, move on to enjoy a 2.5-hour leisure walking along the Golden Whip Stream, where is most likely to bring you into the Pandora's wonderland of the movie Avatar. Another full day to explore the beautiful Zhangjiajie National Forest Park, you will ascend the Yuanjiajie Mountain by the Bailong Elevator - a glass elevator built into the side of the mountain. On the summit, you will take about 2.5 hours to walk to discover the Pillar of the Southern Sky. It was used to inspiration for the famous "Hallelujah Mountains" in the movie Avatar. Proceed to the platform of Forgetfulness to enjoy the nearby peak views and then walk across the No. 1 Bridge under Heaven. After lunch, climb up the Tianzi Mountain. Then take a cable car down the mountain to enjoy a walking tour along the dreamlike fairyland – Ten-mile Natural Gallery (mini train is optional). After breakfast, drive to the beautiful Baofeng Lake to enjoy a wonderful cruise. Then take the world's longest cable car up to the summit of the Tianmen Mountain. On the summit, you will take a hike (approximately 2 hours) on the plank road along the Guigu Cliffs. During the hiking, you can choose to experience the glass skywalk built along the cliff with an extra expense (RMB5/pp). After the hiking, you will pay a visit to the Tiammen Temple and take the cable cars to the middle station. Later, take a bus along the Tongtian Avenue (a famous mountain-winding highway in the world) to explore the Tianmen Cave. Return your vehicle and head to the airport for your departure flight.